Around the start of the 20th Century, McTeague (also called Mac), a hulking, slow-witted man, works in the mines of the California hills where he lives with his mother. When a traveling dentist passes through their area, Mother McTeague decides that Mac should go with him and try to better himself in life. Mac becomes a dentist in San Francisco and, one day, falls for his friend Marcus's cousin and "sweetie", Trina, as she sits in his dentist's chair. Marcus agrees to let McTeague pursue Trina, and the two eventually become engaged. Trina wins $5000 in a lottery and marries Mac, much to Marcus's chagrin. However, she turns out to be an extremely miserly woman who refuses to spend any of her winnings and tightly controls Mac's spending as well. Marcus leaves town to become a rancher, and, soon afterward, the McTeagues receive a letter saying that Mac must stop practicing dentistry since he has no official license. Mac gets another job but loses it quickly; meanwhile, Trina's stinginess worsens. Mac begins drinking and forces Trina to give him money by abusing her. He eventually leaves home, and Trina starts working as a scrubwoman at a school. Mac finds her there, worshiping her lottery winnings, and demands she give him the money. When she refuses he murders her and steals it. Marcus sees a wanted poster for McTeague and sets off after him, claiming the money is rightfully his. A now bearded Mac wanders into Death Valley with his mule and the money, and Marcus goes after him in the blistering heat. 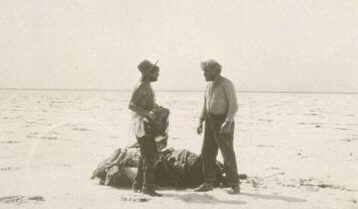 Out of water in the extreme conditions, Marcus finally catches McTeague and demands he give him the money. The men begin fighting, and Mac bludgeons Marcus to death with a pistol. McTeague realizes that during their struggle Marcus has managed to handcuff his wrist to his own. Alone and also without water, Mac is stuck in the middle of the desert area, chained to the corpse of his former friend; the camera cuts out to gradually longer shots of McTeague in the desolate landscape. A wonderful but fragmented film, Greed survives today in spite of the studio’s attempt to kill it. Of course, such an extravagant, sprawling work shot on location could probably not have been made in the 20’s without studio resources. Against von Stroheim’s wishes, however, the film was gradually whittled from nine hours to just over two, causing some confusion in its continuity. But many brilliant sequences are preserved even in this compressed version because of the extensive use of the long take. These lengthy, static shots along with the location shooting also give the film a sense of realism that is rare at this point in cinema. Yet on top of this authentic surface sits a symbolic layer of meaning that touches on deeper themes and universal concerns. This mixture of reality and symbol, of complete, sustained segments and jerky incongruity makes for a unique and fascinating film—all the more so when one considers the bulk of footage that has been lost. In addition to making effective use of locations such as San Francisco and, incredibly, Death Valley, the film augments its realism with dynamic characters. They seem more realistic than other silent film roles mainly because the vices and peculiarities of human nature are given full display. Gibson Gowland seems perfectly natural as the unintelligent and generally docile McTeague whose inherited character fault manifests itself in his petulant anger. After a confrontation where Marcus throws a knife that barely misses his face, McTeague becomes enraged, not at his friend’s extreme action, but at the fact that is favorite pipe was broken in the skirmish. His introductory scene sums up Mac’s character well as he finds an injured bird and begins to caress and even kiss it. When another miner knocks the helpless creature out of his hands, McTeague’s sympathy turns to rage, and he tosses the inconsiderate fellow down a hill. This sequence echoes Mac’s naturalistic decline in the film as a man whose gentleness and compassion are defeated by his hereditary brutality coaxed out by the disturbing behavior around him—"such was McTeague". Trina, played by Zasu Pitts, is a fearful woman whose destructive obsession seems almost inhuman. One can only sympathize with Mrs. McTeague when Mac begins to physically overpower her, a situation foreshadowed by her apprehension to join him after the wedding. Indeed, one wonders why she even married him in the first place; she certainly seems happier with her gold coins, even as a solitary scrubwoman. But perhaps her say on whom or if to marry is minimal since Marcus decides on his own to let Mac have her. Regardless, this noble gesture by Marcus leads to the resentment and hate that will be the ruin of them all. Jean Hersholt does an excellent job transforming Marcus from crude but good-natured to embittered and vengeful. In a characteristic deep-focus shot, Mac sits in the background of the bar, contentedly smoking his pipe, while Marcus drinks at a table in front of him, simmering with disgust and anger. As he asks Mac to pay him back and gradually works himself into a fury, there is a sense that Marcus is most angry with himself for giving Trina up and with the chances in life that have not gone his way. The irony is the things of McTeague’s that Marcus so envies would undoubtedly have made him miserable as well. The film presents a pessimistic but often honest view of the characters' innermost desires where the ultimate goal in life is to attain wealth. There is a frequent use of symbolism, some of it explicitly clear in meaning. As Mac and Trina are married, a somber funeral procession passes by on the street below—certainly not a good omen for the new couple. The caged lovebirds often mimic the interaction between the McTeagues, and Marcus is linked to a cat that tries to attack the creatures while the Dental Examiners’ letter is read. Also, like the caged birds, the McTeagues are ‘trapped’ into their sordid lifestyle by Trina’s obsession and Mac’s subsequent idleness. Trina would gladly trade her marriage for money as symbolized by her excited reaction when she thinks Mac is going to sell the birds. The couple’s wedding portrait recurs throughout, reiterating how low they have sunk, and becomes torn after their separation. Additionally, expressionistic inserts comment on the evil, destructive nature of greed as abnormally long zombie-like arms caress gold coins and objects. Other sequences feature more abstract associations or poetic compositions. When Marcus considers the fateful decision to give Trina up to Mac, he rises to look out the window of the pub. The point of view sequence shows people outside on the boardwalk then goes further out to focus on the expansive sea before returning to the passers-by. These shots possibly follow Marcus’s forming thoughts of pity for the anguished and lonely McTeague but, more generally, establishes a sense of great consequence for this moment. Intercut with this scene are somewhat ominous shots of a player piano in operation that may suggest the falsity or emptiness of the friendship the two men are currently celebrating. As Mac attacks Trina at the school, the Christmas decorations play up the contrast between what is meant to be a joyous season of giving and the complete selfishness and degradation of the characters. Another memorable shot occurs when Mac walks into the night after killing Trina and looks up to see clouds spreading over the moonlight. Two policemen have just missed seeing him, but this image gives the feeling that an ill-fated end still awaits Mac. Towards this end runs a primarily verbal motif of the words "damn" and "hell" sprinkled throughout the dialogue; the word "Hell" is also visually prominent on a sign in the saloon Mac often visits. These terms can represent the common language of the middle-lower class characters depicted but also exhibit the film’s darker view of life in this society as a hellish existence. The final segment gives a brilliant visual representation of this idea as Mac wanders into Death Valley with Marcus in pursuit. The final masterful sequences represent the apogee of the film’s symbolic realism. Shooting in extreme conditions, the filmmakers create a desolate, Hadean landscape with long shots that dwarf the characters in their surroundings. Mac becomes afraid in the desert night and fires his last bullets into the empty hills. Marcus’s greed for revenge and for the money compels him to go deeper into the valley, in spite of the Sheriff’s warnings. But when the two men finally meet, survival instincts temporarily get the better of them, and they jointly attempt to get the water pack off the mule. When that fails the men are reminded of their shared animosity by noticing the spilled bag of coins. This sequence directly establishes greed as a propagator of hatred and as an unnecessary evil desire—the men begin struggling with each other, but what for? Marcus’s dead body being handcuffed to Mac illustrates the idea that he is accountable for his action and may not leave it behind. More abstractly, it suggests that man is partially responsible for his fellow man and ultimately cannot isolate himself from others. McTeague’s final act is to release the caged bird, a reminder of his kindness and compassion (remembering from the very first of the film) and a symbol of himself and his spirit. The creature, however, cannot ascend from this place and falls dead a few feet away. Greed has cost McTeague everything, including any chance for redemption. The film provides a sharp critique of certain negative aspects of capitalism in American society, one of which being the pursuit of wealth at the expense of all else. The gluttonous guests at the wedding feast present an unpleasant picture of excessive consumption. As Mac notices the variety of animals in Death Valley, he says "God!…what a country! ", commenting on the region. This could also be read, however, as a statement of amazement regarding a nation where people behave as these unusual characters do. It is ironic that Greed was a victim of its main thematic concern and was mangled in an effort to make it commercially viable. But its brilliance has survived, and the film holds up excellently, mainly because it works on so many levels.